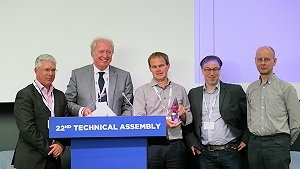 VRT Sandbox LiveIP Studio wins first EBU Award for Technology and Innovation. Geneva, June 2016: The recipient of the 2016 EBU Award for Technology & Innovation, the VRT Sandbox LiveIP Studio, has launched a new age of convenience and flexibility in professional television programme production. In the future, the award will be given annually, based on an evaluation of factors such as impact and innovation. An IP and IT based studio, using open standards, has been built at the headquarters of VRT (the public service broadcaster for Flanders in Belgium). It is a collaboration between VRT and EBU along with ten technology partners. Television is a complex business. For programme production we need to store, edit, and process images and sound. For many years, the equipment needed has been interconnected by myriads of fixed wires and connectors. The future will see extensive use of ‘Internet Protocol’ and IT technology in the studio, which will have many advantages. The age of IP production has been launched with the building of an all IP broadcast quality live TV production studio. By creating a practical implementation, new technology could be tried out, and benefits evaluated. Many important decisions will be made in the coming years by broadcasters across the world about the move to IP and IT programme production. The world will have answers to many important questions thanks to this project. The principal individuals involved in the project included Mick De Valck (VRT), Karel De Bondt (VRT), Wouter De Cuyper (VRT), Michel de Wolf (Dwesam), Félix Poulin (EBU) and Willem Vermost (EBU) and staff of partner companies.